For weeks I’ve noticed this small, gray-brick, square building, on Woodward Heights near 9 Mile. It always seemed closed or empty, so I’ve never stopped. But with the only thing nearby being a boarded up gas station, it’s simple yet modern feel jumps at you from the street. I decided to stop and pick up a to-go menu and ultimately we decided this was our destination for the afternoon. 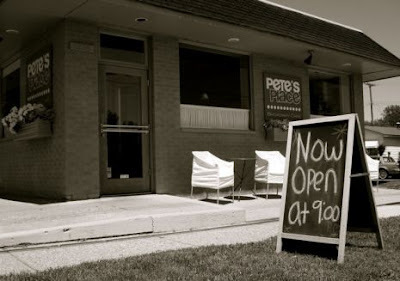 With Broadway tunes blaring and play posters lining the walls, there’s no question where Pete’s gets its name. The clean lines, white and silver decor and fresh flowers reminded me of a place where I once ate in Hell’s Kitchen in NYC, although it was about 1/5 of the size. Since I had breakfast on the brain, I went to that section of the large, one-page menu. There are egg platters and omelets galore, including one with broccoli, portabello mushrooms and Gruyere cheese. But then… I found the real prize — asparagus Benedict. Daniel can attest to the fact that I love, love, love, love Hollandaise sauce. Just about every time we have asparagus for dinner, it’s drenched in the thick, lemony, buttery sauce that’s oh-so-bad-for-you, but tastes oh-so-good. Now that I’m not a meat-eater, I miss the good ol’ days of ordering Eggs Benedict, complete with a slathering of sauce (although I never much cared for ham even when I ate meat). To find asparagus Benedict — it just made sense. Why had I never thought of it before? I ordered it, and waited. I tried to determine which play each song was from to pass the time. (Although I’ve seen several Broadway plays, I did poorly at this exercise). Then the waitress rounded the corner from the open kitchen window and set down….. an omelet. An asparagus and brie omelet. Don’t get me wrong — this would have been what I ordered next time. The waitress mumbled something about the cook hearing her wrong and said, “Let me know if it’s not OK.” And walked away. It was kind of an odd exchange, but I love asparagus and I love Brie, so I went to town. About half-way through, the cook (who is possibly owner Peter Mel) stopped out to apologize and I said it was fine. The omelet was very rich, even though I do love Brie. It was good. They were out of parsley potatoes, but I hope to try those next time too. “Act I” selections range from about $5 to $8 depending on what you’re getting. The “Auditions” portion of the menu — appetizers — includes everything from soups and salads, to sauteed artichokes over spinach, a Brie and fruit plate and guacamole and chips. Dan got his meal from the lunch portion of the menu — “Act II” — considering he doesn’t eat eggs and there weren’t any options other than French toast that don’t have eggs as a main ingredient. (Note: French toast can come plain, with blueberry compote or a caramelized pecan sauce. Sounds like dessert, but it still might be worth sampling). This section of the menu includes sandwiches, a burger and several paninis, only two of which don’t involve meet. He opted for the portabella one, which comes with arugula, tomato, goat cheese and balsamic vinaigrette (he went sans cheese). The other veg option basically omits the mushroom. Act II prices are all in the $6 to $7 range. Pete’s also an interesting mix of items available for dinner — “Act III.” There are several different types of pasta, including one with broccoli and pine nuts, another with fresh vegetables and pesto and ravioli. Wheat and gluten free pastas are available. Other options, for the meat eaters in your life, including prime rib, salmon, classic chicken picatta (an old favorite from my meat-eating days), fish and chips, lemon garlic shrimp linguini and chicken Marsala. The most expensive thing is the salmon, which is $12.95. They have several non-alcoholic drink options under the “Take Five” section, including Starbucks bottled Frappuccino, fresh lemonade and sun tea when available and your regular sodas and the like. Bring along your own bottle of wine — but there’s a $5 uncorking fee. And, what Broadway show wouldn’t be complete without the finale? Desserts include molten volcanic chocolate cake, Bloomfield Canopy Cheese Cake with blueberry compote, slices of fresh baked pie, and fresh grilled pineapple with ice cream and hot rum sauce (um…I need to go back there stat). Desserts are about $3 to $5. Add a scoop of ice cream for an additional $1.25. Pete’s Place, 1225 Woodward Heights in Ferndale, seems to have just launched its Web site, which didn’t exist yet when we visited. You can check everything Pete’s has to offer HERE. While I, personally, am tired of the rain, my pot of herbs are soaking it up and loving it. A few weeks back I bought rosemary, garlic chives, sweet basil and cilantro at the Rochester Farmer’s Market and Dan picked me up a giant pot to plant them in. I threw in a couple of leftover purple pansies for color too. Then, a couple of weeks ago, I couldn’t help but swing into Home Depot when I was driving past its Garden Center. We don’t really have a place to have a vegetable garden at our rental house, so I decided I wanted to crowd our front stoop a little more with some vegetable pots. In the interest of space, I decided to go with only two though I was tempted to buy one of every kind of veggie Home Depot had. I got a “hearty cherry tomato” plant and a green pepper plant. The nice man inside told me how much space each plant needs, so that helped to confirm my choice to buy only two. One thing I never would have done on my own (I’ve never before grown vegetables) was to plant the majority of the tomato plant under the dirt — leaves and stem included. Apparently, if you do that, any leaves/branches that are planted underground turn into roots and it all leads to bigger fruit/vegetables. So, that’s just what I did. A couple of days after that, I stopped my the rickety old fruit and veg stand by my sister’s place in Milford and they had onion starters. I really, really like onions. So, I had to go for it. The only problem was, I didn’t have any large pots left. So I planted a couple of the miniature onions on the outskirts of both the green pepper pot (the one on the left) and the tomato pot, and a couple in the small pot to the right of the big ones. I think that will stunt the onions’ growth and probably leave them looking more like shallots, but oh, well. At 99 cents a pound, I’d say the 13 cents i paid for about 2 dozen starters was worth taking a shot at it. So far I’ve used some of the rosemary in some dish I made, I used the cilantro in our black bean tacos last night, and I’ve made a couple of Caprese salads with the basil. The other night I made asparagus with hollandaise sauce and just to try something new, I chopped up a little of the garlic chives and a little of the rosemary, and sprinkled half of my plate of asparagus with each. I thought there would be a clear winner, but both were delicious and didn’t take away from the sauce itself, which I was concerned about because I love it (I could drink it. It’s sad, really). I keep meaning to cut up the herbs to throw on a salad or on toasted buttered bread for dinner, but haven’t remembered once. We’re having a salad bar at work this week, so maybe I’ll remember for that. And even though I won’t have tomatoes or peppers or onions until, oh, Labor Day, (if I’m successful at all) it’s exciting to try my hand at this. Some day I hope to have a giant garden in the backyard of a future home, so I guess until then I’ll just keep trying stuff and practicing.